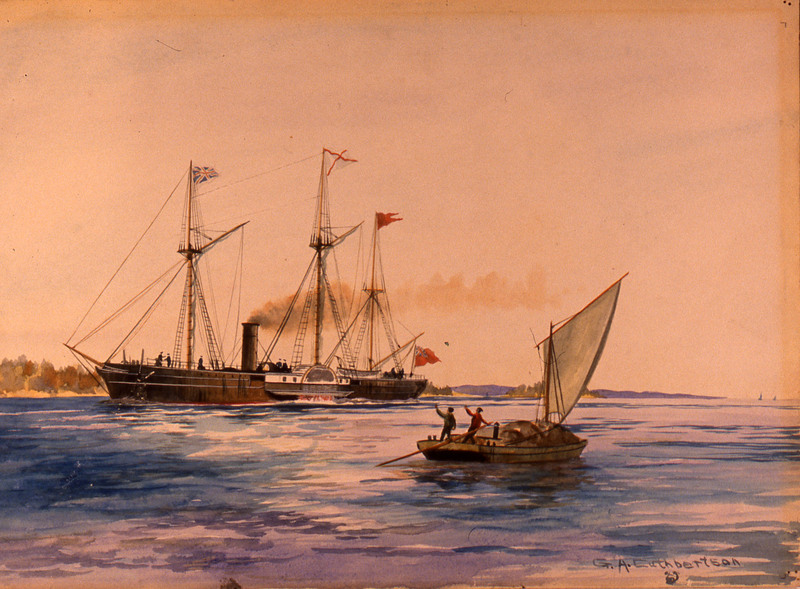 The first steamboat on the Great Lakes, the Frontenac, was built on the shore of the Bay of Quinte (Lake Ontario) between Milford and Bath Ontario on property owned by the mother of Henry Finkle, who put up the bond for the builder, to the syndicate that financed the building of the steamer. It was launched in 1815, and sailed to nearby Kingston (Ernestown is part of Kingston) where the engines were installed. It began service in 1816. The Frontenac was 152 feet long at the keel, 30 feet beam, depth of hold 11½ feet, and drawing probably 5 feet and 6 feet when loaded. She was powered by a 40 horsepower single stroke Bolton and Watt steam engine. The latest thing, and the best quality, The Watt in the firm name being the son of the inventor of the steam engine. She was built to look and act like a sailing vessel, in fact was sailed from Bath to Kingston to have her steam engines installed.